Premier fly fishing retreat on the Big Hole River between Dillon and Butte. 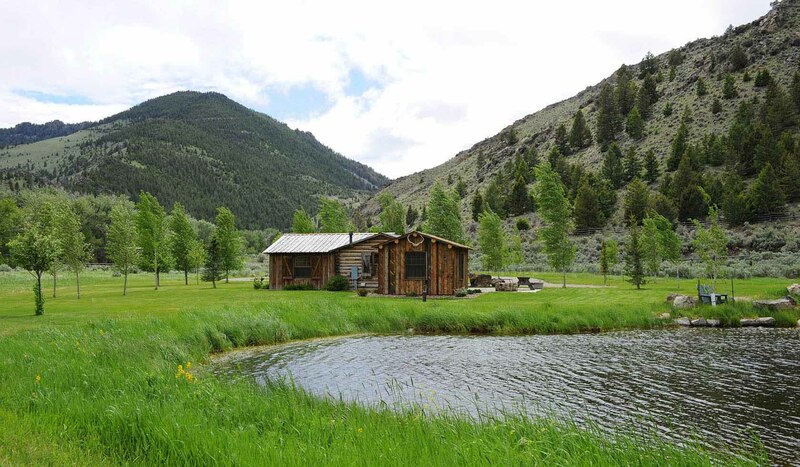 The property has a stocked trout pond, a quarter mile of direct access to the Big Hole River, and incredible privacy on over 75 acres. This is a historic one room cabin that's had the addition of two bedrooms and a full bath, turning it into a charming vacation home. Brief Description: Big Hole Canyon Ranch is a fisherman's dream. Out the door is access to the Big Hole River, a fisherman's boat launch less than half a mile away, and a stocked trout pond just off the deck all make for a great experience. The ranch's beautiful hand-hewn log cabin has a rustic western feel but is appointed with top quality amenities and furnishings and is a very comfortable home base. Located on 77 acres in Maiden Rock Canyon this is both a prime fishing property and a great family or romantic retreat. Guests enjoy hiking and exploring on the property and on the adjoining Beaverhead Deerlodge National Forest. General location: The cabin is five miles north of Melrose, Montana easily accessed by taking Interstate 15 south from Butte or north from Dillon. The property borders the Big Hole River. Bedrooms and baths: There are two comfortable bedrooms, one with a queen size bed, the other with two double beds. Great mattresses and high quality linens will make it hard to get up in the morning! There is additional sleeping space on a queen sleeper sofa in the living room. The cabin has one full bathroom with a tub shower combination. Kitchen & Dining room: The small kitchen is fully equipped, with high quality appliances including a gas range, coffee maker, microwave oven, a full size fridge, blender and all the cookware and serving ware that you'll need. There is a dining table for four but where you'll probably want to take your meals is outside on the wonderful deck overlooking the pond. Living room: The charmingly rustic living room has a beautiful rock hearth with gas fireplace and a sofa with a pullout sleeper. There is a flat screen TV and a selection of DVDs to enjoy (but no TV reception in the canyon), a boom box for CDs, an iPod dock, and a good selection of books and board games. Outdoor amenities: Guests will find a built-in stone fire pit and plenty of outdoor furniture on the porch, a gas grill for barbecues, and Adirondack chairs and stone benches out by the pond and river. The pond is stocked for catch and release fishing and the river is just out the back door. The views are of natural, wild hillsides. Not another house or light in sight! (Note: The train goes through the canyon, across the river from the cabin, so you'll see that go by a couple of times a day.) Activities nearby: Fishing on the Big Hole River! You can launch a boat upstream and take out is just a stone's throw downstream from the cabin at Maiden Rock. Because this take out is just downstream from the cabin, the only fishing boats you see going by are in late afternoon. The rest of the day the river out front is yours! The famed Beaverhead, Ruby, and Wise Rivers are also an easy day trip for fishermen. Enjoy walks on the property and on adjoining public land, and visits to local historic sites. For rock climbers, Humbug Spires is just a few miles away. Closest town and airport: Grocery stores in Butte and Dillon are 27 and 35 miles away respectively. Butte is the closest airport, with Helena, Bozeman, Idaho Falls and Missoula also being good options.